Wavin Revit content packages are easy to use, providing BIM modellers with a hassle-free building construction tool that can quickly and seamlessly transition from a 3D model to the real build. With integrated intelligent assistance, our Revit packages allow modellers to split pipes into actual optimal lengths – one of the many features of our Revit content packages. Let’s see how it’s done. 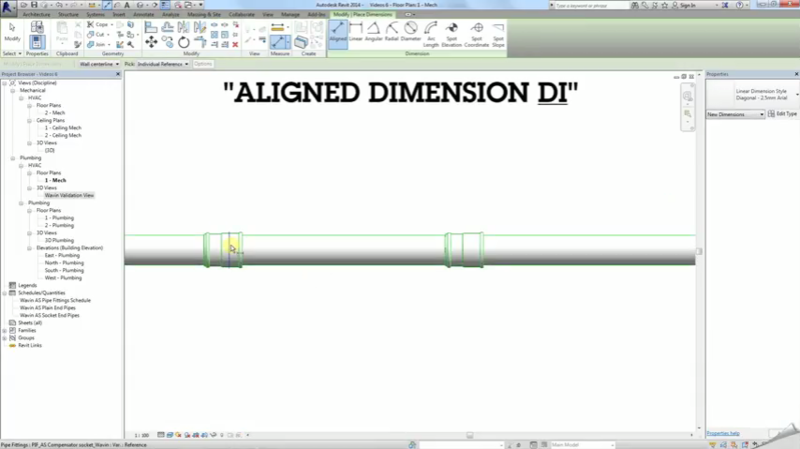 Revit piping functionality cannot automatically restrict the length of a drawn pipe, so you have to manually split the pipe after it is drawn. In Wavin AS systems, for example, the maximum available pipe length is 3 metres. So if you have a 10 metre pipe that needs to be split in no longer than 3 meter increments, how can Wavin’s Revit content packages make this a fast and user-friendly process? It’s really simple. Looking at the floor plan drawing on your screen, the most precise way is to begin by placing the splits anywhere on the pipe – then create an aligned dimension between the fittings. The next step is to attach the dimensions to the reference points of the couplets, right where the pipe ends. You may need to use the tap key to select the desired point. Then, select the couplet that you wish to move and click on the dimension. At this point, you can edit it. Type in 3000 (which is the maximum pipe length in millimeters). The couplet will move and the pipe length will be exactly 3 metres in length. If properly done, this method could quickly place a whole sequence of couplets on a long piece of pipe in only a matter of minutes.